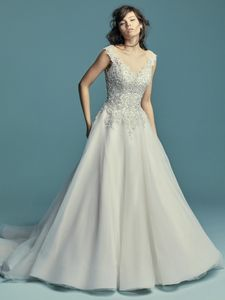 Description: This princess wedding dress features a bodice of beaded lace motifs accented in Swarovski crystals, trailing into a ballgown skirt comprised of tulle. Featuring a scoop neckline, illusion cap-sleeves, and a V-back with pretty lace-up detail. Finished with half corset and half zipper closure or covered buttons over zipper closure.